Our Math Bulletin Board Ideas page will provide you with great resources for a number of math related topics. Our bulletin boards will help you integrate various activities into your daily curriculum. Ideas within the math bulletin board pages include resources for the following: operations, measurement, and number sense. As part of a math lesson on graphing, students are able to share their favorite type of cereal (photo below). 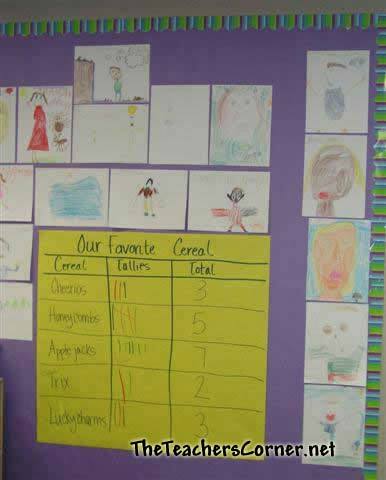 Using a large piece of paper, create a chart that contains the following: chart name, cereal names, tallies, and total. (You can either leave it open to whatever cereal they name, or you can offer them 4-6 cereal types to choose from.) As students vote for their favorite cereal, they place a tally mark in the "Tally" column. As a class, add the tallies and place that number in the "Total" column. Students can then draw pictures of themselves eating their favorite cereal to place around the chart. I used 10 numbered problems and allowed the students to do them for extra credit. After all of the interested students had submitted their answers, I then added the answers to the board. Let's go racing! Using a circle pattern and several different colors of construction paper, have each child construct their own clock. (The size really depends on the amount of bulletin board space you have and the number of kids in your class.) For younger students you may want to also supply them with patterns for the hands. After they have their clock pieces cut out, students should add the numbers. Using a brad, have students attach the hands. Have them think of their favorite time of the day. Students should set their clocks to that time. They then need to write out the digital time that their clock shows. Do this on a small piece of paper and hang it from the bottom of the clock. On a little larger piece of paper, attached to the clock or next to it, students write a few sentences of why this is their favorite time of the day. Prior to beginning this activity, you may want to have the construction paper pattern block shapes already cut out and read for the students. (If you have access to Elison die cuts, check to see if the pattern block shapes are available.) 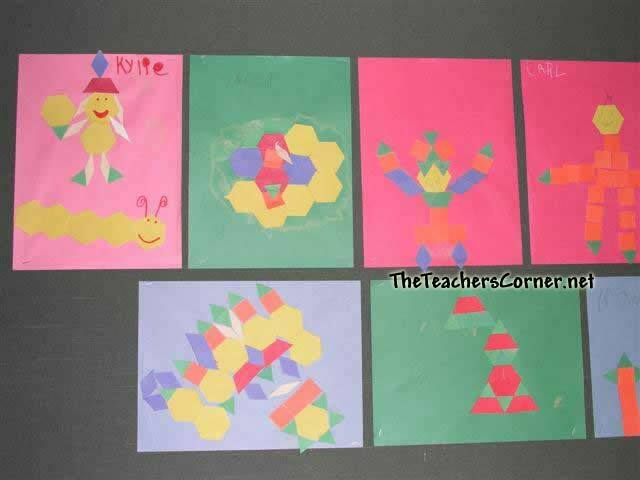 Students then glue the pattern shapes to their larger piece of construction paper to create a shape. This activity would work great for any season or theme of the school year. This is a great interactive bulletin board. It can be used for other subjects as well. Draw your clown and balloon shapes. Laminate all pieces. 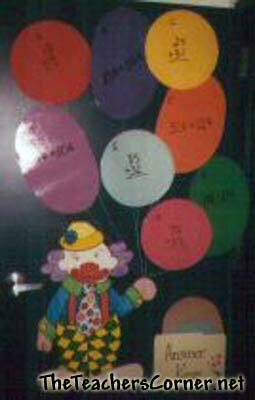 Use a dry-erase or visa-vie marker to program your balloons. (Don't forget to number or letter them so you can make your answer key.) Take a file folder, decorate, laminate, and tape/staple onto the door/wall to hold your answer key. Please EMAIL your favorite Math Bulletin Board idea.